Netflix Adds HD Category To Its Watch Instantly "Genres"
Netflix has made a welcome change that makes it easier to find their newly integrated HD (720p) online streaming “Watch Instantly” videos. We’re not exactly sure when the change happened, but we’re pretty positive that it occurred within the last 72 hours. Engadget had reported a couple of weeks ago that a small HD logo was visible within the video description, but now Netflix has given its HD collection a dedicated category under the “Genre” sub-tab (see below). Note that HD is currently only available for Mac and PCs running the Silverlight browser plugin. Somewhat surprisingly, there are already about 650 titles offered in HD on Watch Instantly, although of course as with the rest of the online streaming, not all of the selections are exactly Oscar-worthy. However, as the price of the service has not been affected with the addition of these HD titles, the added quality is a nice bonus for Netflix users that have patiently waited for online streaming to truly add value to the DVD subscription service. 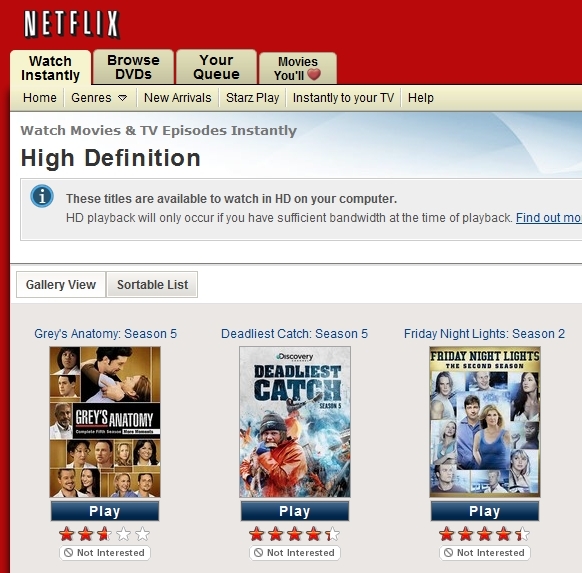 Read next: Netflix Adds HD Category To Its Watch Instantly "Genres"